My wife, Therese and I might never have visited Gibraltar had we not been invited to a wedding in Marbella. But we had time to spare and the distance was not great, so why not? A few minutes’ taxi ride brought us to San Pedro, where we caught the 8.30am bus that would carry us to La Linea in little more than an hour. Had we missed that bus, we would have had to wait nearly five hours for the next. On arrival at the border, we joined the hundreds crossing into the territory, most of them no doubt going to their workplaces. The Customs and Border check was very perfunctory, the bored-looking officers merely glancing at passports or identity cards and waving everyone through. A free shuttle bus awaited to take us to the cable car. It filtered out into the line of traffic, that remained stationary for several minutes while an aeroplane landed. Then along with the other vehicles and large numbers of pedestrians, we crossed the airport runway into the town, which seemed to have been squeezed as tightly as possible against the limestone cliff. 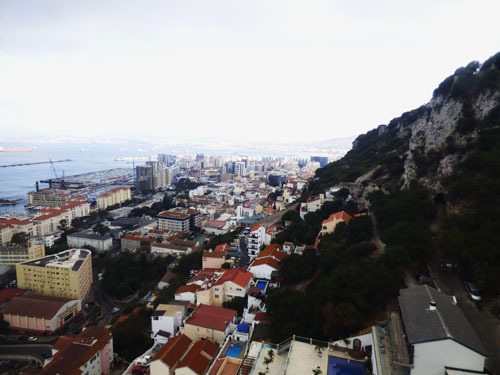 The streets were narrow and congested, with buildings clinging to impossible slopes, the middle reaches of which were pocked with defensive tunnels dug when Gibraltar was besieged by Spanish forces between 1779 and 1783, and more recent ones excavated during World War II. 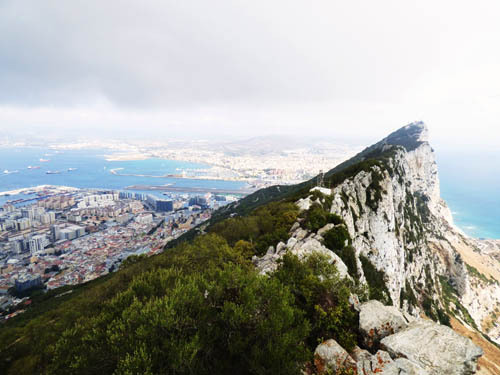 Below these was the Moorish Castle, that dated back to the time of the Muslim occupation of the Iberian peninsula, as, indeed, does the name ‘Gibraltar’, which is derived from ‘Jebel Tarik’ or ‘Tarik’s Mountain’, after the Moor who invaded from Africa in 711 AD. 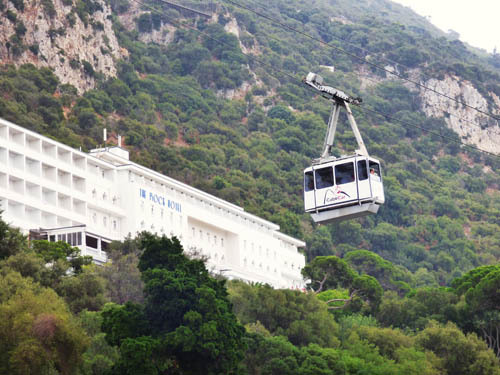 As it was still morning, only a handful of visitors were waiting for the cable car. Later, the numbers would swell into a substantial queue. The car took six minutes to reach the top of the Rock. As it rose, it opened a view of the town that reminded me, though it was on a much smaller scale, of that over Hong Kong from the ascent of Victoria Peak. The airport runway, protruding into the bay, looked somewhat unnerving, while the military significance of Gibraltar was reflected in a pair of cannons pointing out to sea from the base of the cliff and a submarine moored in the harbour. The top of the Rock held a thin cap of cloud and a haze spread over the sea, obscuring any possible sighting of the Moroccan coast, so while we waited for the sun to burn through, we took the time to eat the breakfast we had foregone because of our early morning start. Again, there were, as yet, few visitors in the café and the baguettes and tea were not expensive. We stepped out onto the balcony, where we met the first of the Barbary macaques. These wild monkeys may look innocent and cuddly, but they have a cunning that must not be underestimated. I watched a lady take a camera out of her handbag, which she then placed on the ground. Within a second, the monkey she wished to photograph jumped down and snatched the open handbag. Had the lady’s companion not grabbed the bag a second later, its contents would have been irretrievably scattered down the shrub-covered precipice. Elsewhere, I saw another monkey go for a lady’s shoulder bag, and a small child crying after one she had tried to stroke had bitten her. 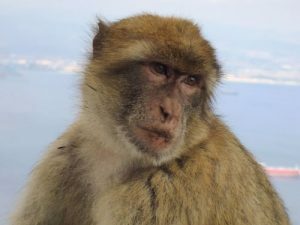 There are some two or three hundred macaques on Gibraltar, most living on the upper Rock, though I did see one crossing a road in the town. How they arrived here is open to speculation. It is thought unlikely that they crossed when Gibraltar was joined to Africa. Their ancestors may have been brought over by the Moors, or even as pets by the British. 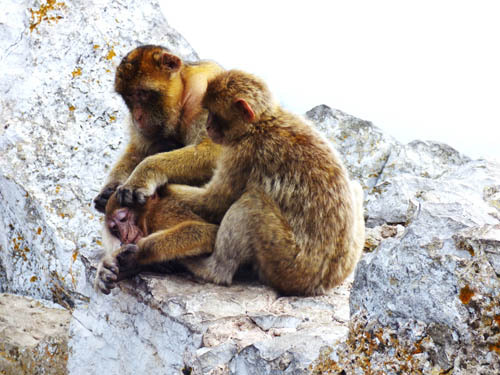 A story, probably apocryphal, relates that Winston Churchill, on hearing of a decline in their numbers, ordered a rescue operation, for it was said that when the monkeys leave Gibraltar, then so will the British. The whole of the Upper Rock comprises a nature reserve, a full exploration of which would have taken more time than we had. We followed the road gently downhill to the south. The strong breeze went some way toward easing the otherwise oppressive heat. After 250 metres, we arrived at Skywalk, a glass-floored balcony that reached out over a 340-metre void, The cliff dropped vertically for much of that distance, then gave way to a less precipitous slope that carried on down to the sandy beaches of the east coast. Therese decided to return to the café, while I continued down, more steeply, for another 450 metres to St Michael’s Cave. This was huge. 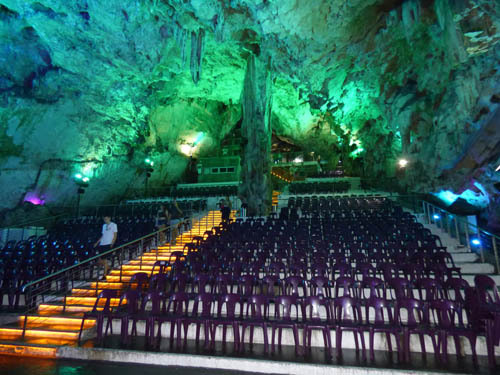 I entered a cavern that was set out as an auditorium, with seating for several hundred people sloping down to a performance space. Coloured lighting illuminated the hall, changing periodically, green blending into blue, then red, gold and shades and tints in between. The cave was once thought to be bottomless, and have passages that ran through to Africa, and it felt as if these might be true as I descended ever deeper into the tunnels, past calcite curtains and some of the biggest stalactites and stalagmites I have ever seen. One of these stalagmites had collapsed and now lies on its side, its broken face polished to reveal its growth rings that tell the story of the climate changes and ice ages of the past several million years. Eventually, I reached the lowest point to which visitors can progress, and the subsequent climb brought me back to the main cavern. I slowly made my way back to the top of the Rock, stopping occasionally to cool down. On one of these rests, a car passed me with a juvenile monkey clinging to its wing mirror. The monkey hopped down onto the road, where it encroached on another’s territory. Chased by the much bigger animal, it jumped back onto the car’s roof, and with amazing agility, bounced into a prodigious leap across to the rock. There was a great deal more of Gibraltar that we would like to have visited, but we had probably seen as much as we had time, or even the energy for. If we missed the afternoon bus to San Pedro, the next would be three hours later. After a short excursion into the town, we re-joined the shuttle to the border. The crowds crossing into Spain were greater than we had encountered on our arrival, and the security even more lax. The border guard did not even glance up at us as we passed through. We took a taxi back to the bus station at La Linea. While waiting for the bus to arrive, I realised that I had left my hat in the taxi. Twenty minutes later, the driver arrived to return it to me. Clearly, Spain’s taxi drivers are much more reliable than Gibraltar’s monkeys.